So today I have to lovely Katy Moran on the blog answering my questions about her new book The Hidden Princess and her writing. 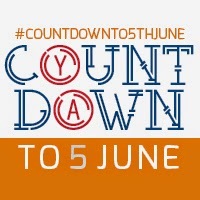 This post is part of the fantastic June 5th Countdown, organised by Jim Dean of YA Yeah Yeah, in order to celebrate all the fantastic YA books being published on the day! Katy’s book The Hidden Princess will be published on June 5th by Walker Books. Thanks for taking part in my interview and the June 5th Countdown today, Katy! It’s such a pleasure – thanks for having me! Your new book, The Hidden Princess (and its sequel Hidden Among Us) is set both in the faerie world and the real world. Its one of my favourite books in the fae genre and I really loved the world you built for it. What gave you the idea for the series? Thank you very much – that means a great deal coming from you, Raimy! I’ve always been fascinated by stories about the Otherworld and fae creatures, but there are two separate triggers that I’ve come to associate with my Hidden books. The first occurred when I was studying Anglo-Saxon archaeology at University (I actually started out writing historical YA set in this Dark Age period). There are a few intriguing Old English terms that point to a serious belief in a race of elvish creatures. The Anglo-Saxons seem to have been quite entranced by peoples’ hair and had lots of interesting terms to describe it – one of these translates into modern English as “elf shining”. So I’ve been nursing the idea of an elvish race that once lived amongst humans ever since the late 1990s/early 2000s. Secondly, when I moved back out to the countryside four years ago, I started noticing the landscape more and found my attention drawn to puddles of shining water on the country lanes as I was driving along. I thought they looked like doors or windows into another world. Were there any specific fae books that made you want to write in the genre? I grew up loving a wonderful book called The Hounds of the Morrigan, by Pat O’Shea – it’s a fantastic children’s adventure story set in Ireland, all powered by Irish mythology. It’s very funny at times, but there is also a definite sense of menace. What kind of research did you do for the series? I didn’t do much research into the folklore, and just relied on the old stories that were kind of hardwired into my brain after growing up reading fairy tales and absorbing details like the fae aversion to iron. The area that actually took the most research was the shortest part of the book – just a few pages! The prologue is set many hundreds of years before I pick up the contemporary story, in the court of Eleanor of Aquitaine – an extremely powerful medieval heiress who was married to two kings and actually ruled England in all but name for several years. Her illegitimate son in The Hidden Princess, Nicolas de Mercadier, is actually based on a real historical character – an assassin employed by Eleanor’s son, Richard the Lionheart. The historical Mercadier was allegedly murdered on the way to visiting Eleanor when she was an old lady, and I wondered if there was some secret connection between them. Eleanor was a great character, but of course there are no real records of her having any illegitimate children, although she was definitely a person who attracted a lot of gossip! What kind of writer are you – are you a planner or a pantser? It varies. The Hidden Princess was actually a very difficult book to write. I spent nine months trying to write it as a direct sequel to Hidden Among Us, which didn’t work at all. After I submitted one draft that really wasn’t working, my editor had the great idea of moving the action along six years. That in turn gave me the idea to have Connie as the lead narrator rather than Lissy. To cut a long story short, this resulted in me re-writing the entire first draft to The Hidden Princess in just over seven weeks from scratch – almost 70,000 words! I had no choice but to plan each chapter out in advance to make my daily word count easier to achieve. We were obviously very short of time at this stage, and I didn’t want to risk sitting staring at the screen wondering what was going to happen next. I also wanted my editor’s input after I’d planned everything out to avoid making any major changes at second draft stage. I know you have a few little ones running about the place, how do you find fitting in your writing with the rest of your life? Do you stick to a set time period within the day to do it or do you just go with the flow? My oldest two go to school and nursery, so I used to have three full days between 9.30 and around 3 to write. I now have a newborn baby as well, though, so I am trying to write 500 words every day whenever I can. I usually get an hour or so in the evening or a couple of hours during the day when my baby is asleep. Sometimes I manage more than 500 words. Eventually I will end up with a novel! Do you have anything currently in the pipeline to follow on from The Hidden Princess, as part of the series or as a standalone? I don’t have anything in the pipeline at the moment, but I’d never say never. I’m currently playing with a couple of different ideas and will soon have to decide which one to pursue. For many years, Cai from Bloodline Rising was my favourite character. He’s very badass but loveable at the same time. But now I think Connie in The Hidden Princess is my equal favourite, if such a thing is possible. Her bravery and rebelliousness definitely appeal to me. In fact, she’s similar in that way to Cai! As a teenager, I absolutely loved Tamora Pierce’s awesome Song of the Lionness fantasy series about Alanna, a girl who trains as a warrior. I also read SE Hinton’s novels to shreds – The Outsiders, Rumble Fish, Tex. I just loved them and would highly recommend them today. The Outsiders was published in 1967 – the first ever true YA novel – and it has definitely stood the test of time. It was my parents! My mum used to take us to the local library in a village called Great Shelford every week. We must have gone pretty much every week for years and years – right through primary and secondary school. I remember sometimes also getting a sausage roll from the bakery next door when we went to the library! There are lots, too many to mention. I would definitely like to meet Jack Kerouac, although I think he would actually be pretty shy. Also Alan Garner. Last year, I saw him give a lecture at the Bodleian Library in Oxford and it was a magical experience. Just as he was speaking about “opening the door to let the story in”, the lecture theatre door flew open and the wind whirled in, spinning a cloud of dead leaves. He’s a magician.